Whenever we see the word Easter, aside from the fact that it’s a celebrated holiday especially among Christians, we’re reminded of bunnies and eggs. While the Japanese tend to be fond of imported holidays such as Valentine’s Day or Christmas, there’s not really much going on when Easter arrives, aside from hanami or flower viewings here and there. Japan isn’t a Christian country, but there are still quite a few Easter-related events around. Disneyland has had their Easter Wonderland event, while other establishments had Easter-related promos and even Easter-egg-shaped merchandise every year–but of course, with a touch of Japan. Since more people are going to parks for the cherry blossoms and for picnics this time of the year, there will be lots of celebrations, drinking and eating. And If you’re planning what food to bring to your picnic, we thought we’d give you some easy to make Japanese food–with eggs. 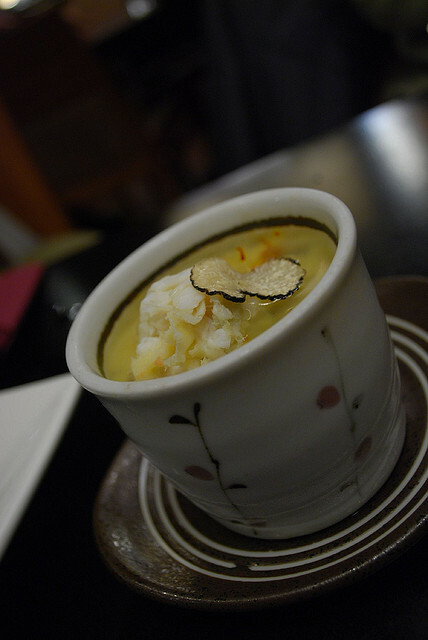 Chawamnushi is a Japanese custard steamed in a cup. Chawan means tea cups or rice bowls, and mushi means steaming in Japanese. Lightly beat eggs in a large bowl. Mix cool dashi soup stock, soy sauce, salt, sake, and sugar in another bowl. Add the dashi mixture in the egg mixture gradually. Strain the mixture. Put mushrooms, chicken, and kamaboko or narutomaki slices (or whatever suits your taste) in four chawanmushi cups, or tea cups. Steam for a few minutes for about 10-15 minutes, or until done. Poke a bamboo stick in the chawamushi and if clear soup comes out, it’s done. Place mitsuba leaves on top of chawanmushi. 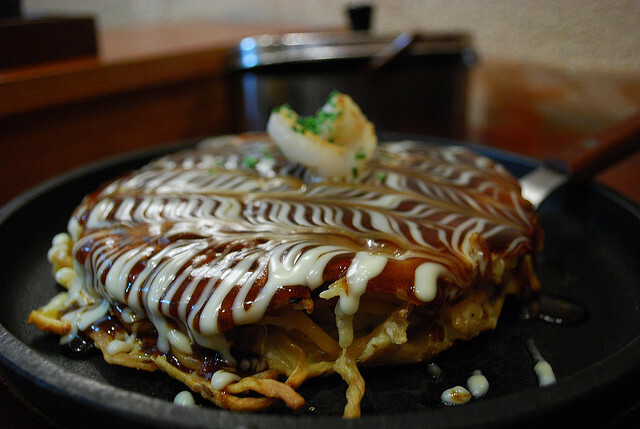 Okonomiyaki is a savory dish that is a bit more like an omelette or frittata than a pancake and it’s made with okonomiyaki flour, eggs, cabbage, pork (bacon), shrimp or other seafood, and topped with a variety of condiments like sweet sauce (Okonomi Sauce), mayonnaise, dried seaweed and dried fish flakes. Tamagoyaki is Japanese rolled omelet and is popularly served for breakfast. 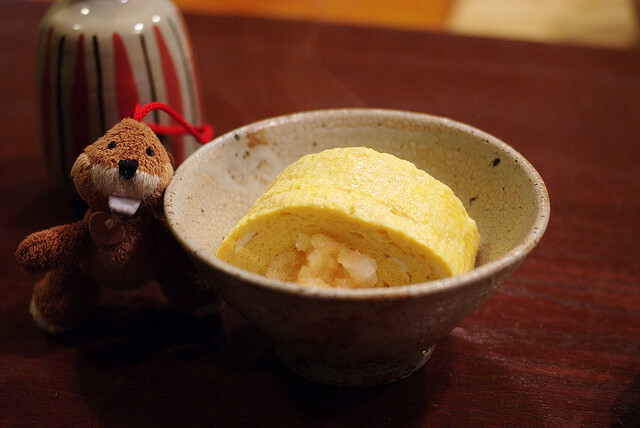 However, flavors of tamagoyaki vary, and various fillings can be added. You can use a square tamagoyaki pan to make tamagoyaki, but it can also be cooked in a regular frying pan. 2 Tbsp – 1 1/2 Tbsp sugar *adjust the sweetness to your taste. Beat eggs in a bowl. Add dashi soup and sugar in the egg and mix well. Pour a scoop of egg mixture in the pan and spread over the surface. Cook it until half done and roll the egg toward the bottom side. Cook the omelet until done. If you are using a regular frying pan, shape tamagoyaki on bamboo mat. Cut tamagoyaki into 1-inch thick pieces. 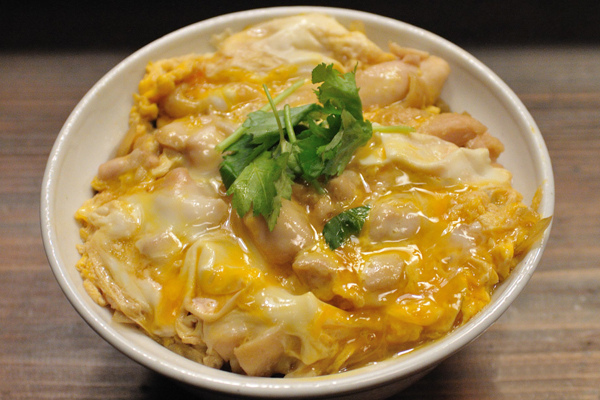 Oyakodon is probably the most popular of all donburi, or rice bowl dishes. It literally means “parent and child bowl,” and is a reference to using chicken and egg in the same dish. With its comforting ingredients simmered in a sweet sauce, oyakodon is a perfect, quick meal. Add the dashi stock, soy sauce and mirin to a saucepan and bring to a boil. Add the chicken and simmer for about 1 minute. Add the scallions and simmer for another minute. Pour in the eggs without stirring. Cover, remove from heat and let set for 1 to 2 minutes to cook the eggs. Put a scoop of hot cooked rice into each of four deep bowls (don). Ladle some of the chicken, eggs and sauce over the rice in each bowl. Sprinkle with the nori and serve hot. Whether you enjoy them hard-boiled, poached, fried, or deviled, eggs are a kitchen staple and delicious in any form. While breakfast has made the egg a culinary celebrity, it’s Easter that has transformed the egg into a cultural icon. 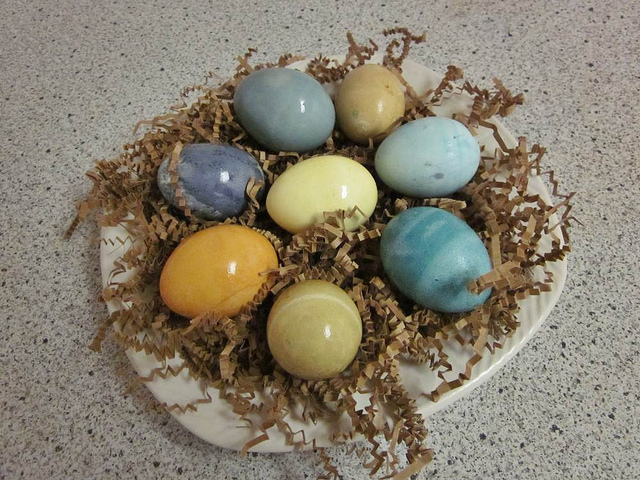 Springtime also brings us eggs colorfully dyed or reincarnated in chocolate. As a source of new life, the egg is a symbol of creation, spring, and fertility in many cultures and religions. please switching Tamagoyaki – Okonomiyaki photo, it’s opposite.